An asteroid with almost no chance of hitting Earth made big headlines this week. July 26, 2002: I slid a dollar bill across the counter, and the cashier handed back a lottery ticket. The odds for winning: 1-in-250,000. A long shot, but you never know. Walking out of the store, ticket in hand, I glance at a newspaper. "Tony Phillips wins the lottery!" the headline declared. Gosh, I thought, that seems premature ... not to mention weird. Right: Lottery tickets and dollar bills. A royalty-free image from Corbis.com. Indeed, it's fiction. For one thing, I never buy lottery tickets. But mainly, no one would write such a headline based on such slender odds. Yet that's what happened this week, in real life, to an asteroid. 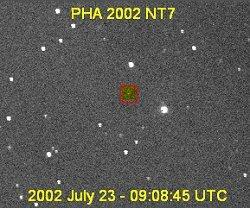 On July 9, 2002, MIT astronomers discovered 2002 NT7, a 2 km-wide space rock in a curious orbit. Unlike most asteroids, which circle the Sun in the plane of the planets, 2002 NT7 follows a path that is tilted 42 degrees. It spends most of its time far above or below the rest of the solar system. Every 2.29 years, however, the asteroid plunges through the inner solar system not far from Earth's orbit. After a week of follow-up observations, researchers did some calculations. There was a chance, they concluded, that 2002 NT7 might hit our planet on February 1, 2019. The odds of impact: 1-in-250,000. "Space Rock 'on Collision Course'," a headline declared days later. 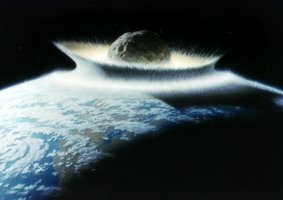 "Asteroid Could Wipe Out a Continent in 2019," another one warned. Really. "In fact," says Don Yeomans, the manager of NASA's Near-Earth Object Program at JPL, "the threat is minimal. One-in-250,000 is a very small number." The odds are not only low, but also uncertain. Yeomans explains: "We've been tracking 2002 NT7 for a very short time--only 17 days so far," Meanwhile, the asteroid takes 2.29 years to orbit the Sun. Predictions based on such a small fraction of an orbit are seldom trustworthy. Below: Many reports this week of an impending collision with 2-km wide 2002 NT7 were illustrated by this painting of a 500-km asteroid striking Earth. Scary. It's becoming a familiar routine: Astronomers discover a near-Earth asteroid. With only meager data at hand, they can't rule out a collision in the distant future. Headlines trumpet the danger. Finally, the alarm subsides when more data lead to a better orbit--one that rules out an impact. "As far as the public is concerned," says Jon Giorgini of JPL's Solar System Dynamics Group, "it just isn't worth getting worked up about an object with a couple weeks of data showing a possible Earth encounter many years from now. Additional measurements will shrink the uncertainty by a large amount--and Earth will (almost certainly) fall out of the risk zone." Already this is happening for 2002 NT7. The calculated probability of a collision with Earth is shrinking as astronomers add new data each day. "I suspect it will take only a few more weeks (or maybe months) to completely rule out an impact in 2019," says Yeomans. "When you project this initial probability region years into the future, it naturally expands. For a newly discovered object with only a few days tracking, the uncertainty region can easily grow to cover a big part of the inner solar system. Because Earth is in the inner solar system, and can potentially cut through this volume of smeared out probability, we end up with finite impact probabilities." "A finite probability, however, is not really a prediction of impact," he cautions, "but a statement that one is possible." Of course, many things are possible. Like the newspaper headline "Tony Phillips wins the Lottery!" But most of them do not happen. JPL lists asteroids like 2002 NT7 on their Internet "risk page" not to raise an alarm, says Yeomans, but to alert astronomers when new discoveries merit attention. "It's important that we continue tracking these asteroids to refine their orbits," he says. The more observers, the better. Above: Astronomer John Rogers captured this image of 2002 NT7, faint and far away, on July 23, 2002, using a 0.3-meter telescope at the Camarillo Observatory. What's an ordinary person to do? The next time you see a headline "Killer asteroid threatens Earth!" ask yourself two questions: Have we known about this space rock for more than a week or so? (If not, check again in a month. It probably won't be considered a killer then.) And what are the odds of impact? 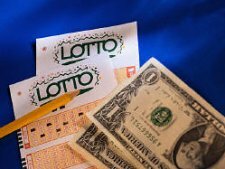 If you're more likely to win the lottery, there's probably nothing to worry about. Editor's note: Big asteroids have hit Earth before and it's only a matter of time before one threatens us again. Will it be years, decades, millions of years? No one knows. The point of this article is not that we are safe from asteroid strikes. We are not safe. Rather, we hope to give readers some of the information they might need to evaluate popular reports of impending collisions. NASA Near-Earth Objects Program -- (JPL) up-to-date information about asteroids, including new discoveries and risk estimates. Asteroid 2002 NT7 was discovered by Lincoln Near-Earth Asteroid Research (LINEAR) asteroid search program.